Are you more comfortable discussing the Quidditch World Cup than the soccer World Cup? Me too. Right now it feels like half of humanity has caught World Cup fever—and that’s because they have. 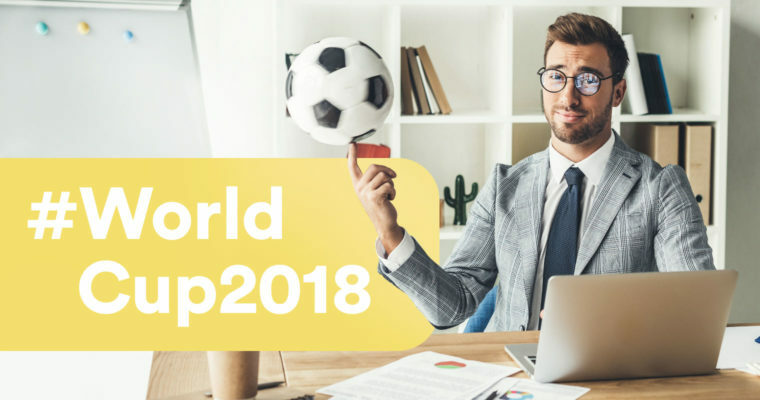 The World Cup happens every four years and around 3.4 billion people (almost half the world’s population) are expected to tune in. This isn’t just a sports tournament, it’s the celebration of a powerful cultural phenomenon. And that seems worth checking out, both because understanding and connecting with other cultures is more important than ever, and because you’ll sound like a credible adult when everyone at the water cooler is discussing last night’s game. Too busy to watch? You can also get live updates on Twitter, read any of the articles on FIFA’s official World Cup News site, and check out Fox Sports’ “90 in 90” highlight videos for the most exciting action of each game. If you’re a podcast lover, check out We Came to Win to immerse yourself in the game’s rich and dramatic history, or jump straight into jargon land with a daily recap from The Game World Cup Daily. And Instagram fans will enjoy whereisfootball (beautiful images showing the cultural importance of soccer around the world), soccermemes (exactly what it sounds like), brfootball (actual updates), and 433 (highlights and viral content). From positions, to strategy, to a whole lot of terminology, thanks to Yahoo Sports you can now decode the puzzle that is known as soccer. The round robin stage of the World Cup. The tournament begins with eight groups of four, and the top two winners from each group advance to the knockout stage which begins on June 30 and ends with the final playoff game on July 15. A breathtakingly fantastic goal scored with especial aplomb, rendering the crowd ecstatic. Getting past an opponent by maneuvering the ball through the space between their legs, causing them to look foolish. When a player falls to the ground and feigns an injury in hopes of the referee awarding them an opportunity to score, such as a penalty kick. Also known as “flopping” in the US. Not to be confused with attempts to raise money for your startup, “the pitch” simply refers to the playing field. An absolute shutout—when a team wins the game without allowing the other team to score. When a player has been playing exceptionally well. The opposite being “out of form”, when their performance is poor. When a player leaps into the air, throwing both legs forward and upward in order to kick the ball back over their head. In certain cases this maneuver will result in a golazo. A warning a referee gives a player for breaking the rules, unsporting behavior, diving, and excessive celebration. Two yellow penalty cards equal a red card, which means ejection from the game. Purportedly one of the best books ever written on the sport, author Jonathan Wilson takes readers on a fascinating journey through the history of soccer tactics around the globe. So the next time your coworker refers to Messi as a false 9, you’ll know exactly what she’s talking about. After decades of playing an ugly, soulless, and disappointing game, Germany ushered in a new soccer renaissance in the late aughts and teens, culminating in winning the 2014 World Cup. Known in Brazil as O Jogo Bonito, the “Beautiful Game,” soccer is the nation’s life and love. Author David Goldblatt chronicles all aspects of this five-time World Cup winner’s special relationship with the game—the magic, the politics, and the violence. WritingWatch Your Tone! A Tone in Writing Quiz TrendsWhat Is a Job Simulation & How Can You Prepare for One? TrendsWhy Do We Call February 14 Valentine's Day? LifestyleHow to Write the Perfect Love Letter for Valentine's Day LifestyleWhat Are the Most Popular Terms of Endearment? TrendsWhat Will Writing Look Like in 2019?